She is associated with smoke or anything that is smokey, there are more than one versions for this association. The common factor in both these versions are that she is said to have consumed none other than Lord Shiva and the immense energy of Lord Shiva emitted from her being as smoke, hence, she is referred to as Dhumavati or “smokey”. This also conveys the real power of Dhumavati. She is also said to be present after everything is dissolved and she transcends time, space and darkness and exists alone. This aspect of the Divine Mother represents the end of the road or the end of life, which is just a matter of time, which everyone knows is coming, but refuses to acknowledge and believe that he or she will end up like everyone else, as smoke. Even though, this aspect of the Divine Mother is associated with Pralaya or the dissolution of creation, the real purpose of this form is to be aware of the pain, sorrow and loneliness of old age, which can easily be identified with a widow, someone who is considered by many to be inauspicious and unlucky. On a higher spiritual level, the smoke can be termed as the Maya or the veil that hides the reality and deludes the mind into believing that bad things always happen to others, it is others who become old, sick and suffer, it is others who lead lonely lives with nobody to care for them, it is others who have to beg in order to survive. The seeker who is striving for Moksha has to face inauspicious in life, the crows, the white sari worn by Dhumavati, the garland of severed heads, the blood and flesh associated with the Goddess is in-auspiciousness at its peak, the kind everyone pretends not to see or looks elsewhere. Parshuram, Durvasa, Angira and Bhrigu who were known for their fiery temperament were said to have worshiped Dhumavati and gained the most powerful Siddhis mainly by appeasing her and gaining her blessings. These Siddhis were so powerful that these sages were capable of controlling the five elements and nothing was beyond their reach. There are numerous Mantras Sadhanas dedicated to Dhumavati, which are practiced by Tantriks and Aghora Tamas Guni Sadhus, mostly or the eradication of enemies and for gaining superhuman powers. Most of these Sadhanas are performed in cremation grounds and involve Tamas Guni Rituals. 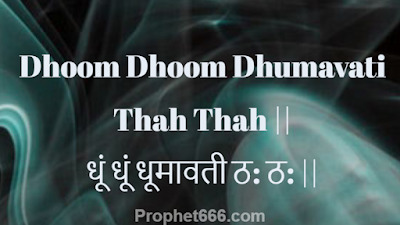 However, not all Mantra Sadhanas of Dhumavati are fearsome, There are some most powerful and effective Mantra Sadhanas of the Goddess, which can be performed for many purposes, including removal of debts and bad luck, annihilation of enemies including the most powerful of enemies, eradication of poverty and getting money and wealth, resolving astrological problems including powerful Doshas like Kaal Sarp Dosha. 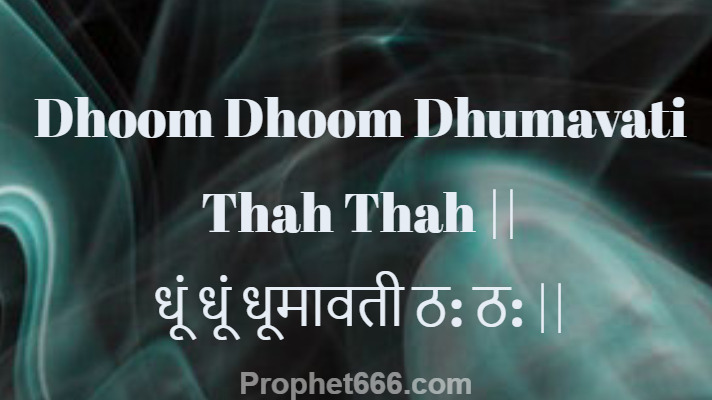 All these Mantra Sadhanas can be practiced by using the Maha-Mantra of Dhumavati. However, the exact procedure has to be learnt from a Sadhak who is well versed in the worship of Dhumavati because this Maha-Mantra is capable of generating immense power and practicing it without proper guidance can be dangerous, even for advanced practitioners of Mantra Vidya. करें .ह्रदय में यह भावना करें की देवी मेरे समस्त दुःख ,शोक,संताप ,पाप,दरिद्रता ,कलह,रोग आदि को सूप में भरकर विदा हो रही है .